Are Spiders Taking Shelter in Your Home this Winter? Are spiders coming inside from the cold, and spending time in your home? Most of us would agree that although spiders are often more helpful than they are harmful, they belong outdoors. And, they won’t go away if you leave them alone. Think you have spiders? Sometimes it’s hard to tell because spiders are typically quite good at staying out of sight. But if you’re seeing spiders in your home, there’s a good chance that there are quite a few, as well as some other creatures that they use as a food source. Use their amazing sensitivity against them. Scents can be a major spider repellent. Lemon, cinnamon, and eucalyptus may all be used in a spray solution as a way to deter spiders. Many also spray their homes with peppermint oil. To do so, fill a standard spray bottle with water and mix in 15 to 20 drops of peppermint oil. Spray down all the cracks and corners of your house. The idea is that spiders cannot tolerate the smell of peppermint oil and will run away in the opposite direction when they detect it. Mice also aren’t too fond of it! Vacuuming, dusting, and sweeping on a regular basis can disturb spiders’ hunting or nesting, which often leads to their looking for a safer place to live. Without easy access to food and water spiders and other insects will not be able to survive in your home, so keeping things clean and tidy can also make life harder for spiders in general. Ensure that your house is closed off to entry. Window frames, screens, doors, vents, chimneys, foundations, and utility conduits can all be entry points should be well sealed and maintained. Calling for pest control services for a one-time treatment will eliminate existing infestations, but it doesn’t do much to prevent them from returning in the future. 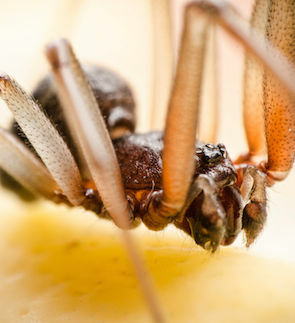 Because spiders and other pests tend to take up residence in your home throughout the year, you would benefit greatly from having year-round pest control in place, and Alexandria Pest Services can offer you the affordable and effective protection plan you need to keep your home pest-free. Each season, we take steps to prevent the most common insects and pests of that time of year, and help keep them out of your home. If you have problem, even after doing your best to take preventative measures, call us at Alexandria Pest Services so we can help you with an inspection in and around your home. Alexandria Pest Services will identify and eliminate pest entry points during our visits. Call Alexandria Pest Services at 703-923-0925 to schedule a professional evaluation. We can help you get rid of these invaders in your home or office!